My last lemon dessert was a bit of a cheat. This time, I’m coming clean. No short cuts. Just pure lemons. Well, not just any lemons. Meyer lemons plucked from a backyard tree by an adorable little boy who says “um” when he means “yes.” This is farm-to-table cooking. The first batch of lemons, carted inside in a mini dump truck, became lemonade with a quick squeeze and a whir of the blender and a little help from Joanne. The next batch was supposed to be transformed into dessert. Cookbooks were scoured, but by the time we decided on lemon bars, the salmon and steaks were ready to come off the grill and we lacked the incentive to blind bake a crust and make a lemon curd. The half pound of butter called for did not endear the bars to us either. So, we skipped dessert and I had to pick up some chocolate on the way back to the airport. But I did dump that truckload of lemons into my computer bag and cart them onto the plane as a carry-on. Back home, the lemons sat in my fridge for a few days, beckoning me every morning as I peered inside to grab milk for my coffee and yogurt for my bowl. They beckoned me every evening as I foraged for dinner. And finally one evening, I beckoned them. I lifted them from their shelf, enjoyed their heft in my hands. I piled them onto my counter and returned for more, my palms lightly perfumed with the oil from their skins. Five minutes to press the cornmeal crust into a pan while the oven heated. Twenty minutes to bake while I whipped together the lemon topping. Lower the heat, pour on the topping, another 20 minutes. Voilà – lemon fabulousness. If Joanne and I had known how easy it was, I might not have taken home my souvenir. Adapted from Alice Medrich’s Chocolate and the Art of Low-fat Dessert. The bars are made in two parts – you first make the crust and then pour the topping over the top. You need 1C of sugar, 1C of flour, 3 eggs, and 3-4 lemons. You also need to reduce the oven temperature from 350ºF to 300ºF when you bake the topping. Make sure to place the pan on a cookie sheet so that the bottom of the crust does not burn. The recipe takes about an hour from start to finish. Prepare. Preheat oven to 350ºF and put rack in lower 1/3 of the oven. Grease 8X8 square pan with vegetable oil. Make crust. Stir together the flour (3/4 C), cornmeal, salt, and baking soda. Beat margarine/butter until creamy. Add the 1/3 C sugar and beat for about a minute. Beat in egg yolk, mayonnaise/yogurt, and vanilla. Add in the dry ingredients and beat on low until just combined. It will be crumbly. Scrape bowl and knead briefly with hands. Press into the pan and prick all over with a fork. Bake on top of a cookie sheet so the bottom doesn’t burn. Bake for 20-25 minutes until the top gets light brown. Make the topping. While the crust is baking, whip eggs and egg white with 2/3 C sugar until combined. Whisk in lemon juice and zest. And finally, whisk in1/4 C flour. Pour the topping on the hot crust right when you take it out of the oven. Turn oven down to 300º. Bake for 15-20 minutes until the topping just barely jiggles. Cool on rack and then chill in the fridge. Cut into squares or bars when cold. Sprinkle with powdered sugar if you’d like. Those bars are beckoning me. And a cornmeal crust! Heaven. 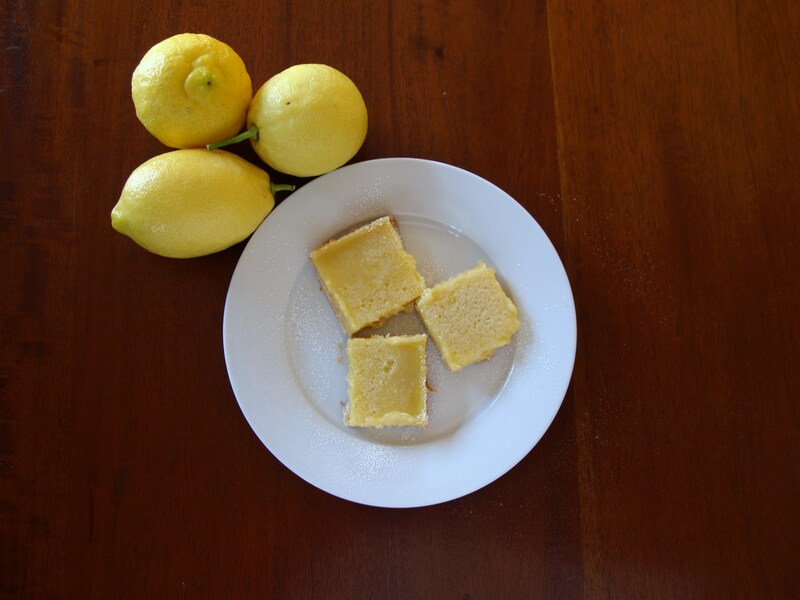 Thanks for stopping by and I hope you do try the lemon bars…they’re so easy and delicious. These look great. I’m a huge fan of lemon bars and I usually cheat and make a boxed mix. I like the idea of making them myself. Great post! On man oh man I love lemon Bars! I’ve never made them from scratch though, thanks for the recipe! This is going on my to-do list. Hi JamieAnne and Kranbox – I love finding new friends — thanks for dropping in. You must try this recipe and let me know how they come out (hopefully better than the box mix). I’m excited to try this recipe. The mix I usually use is a decent one for a mix (http://www.stonewallkitchen.com/barefoot-contessa/dessert/dessert-mixes/542200.html) but I have a feeling that these are going to be even better. 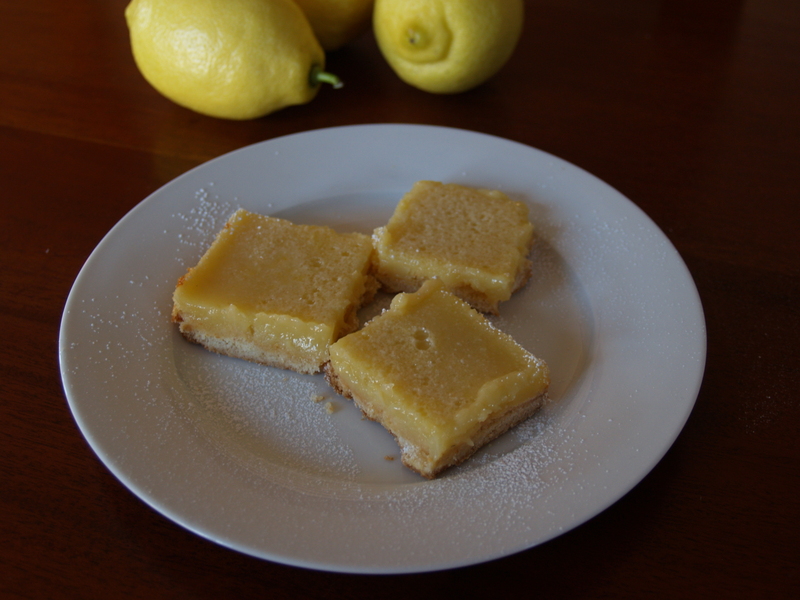 We spend a lot of time outside during the summer, and lemon bars are perfect for outside weather. 🙂 I’ll let you know how it goes! Wow those bars looks so good! Can I have one? These look wonderful! I love lemon flavoured foods so I will definitely be trying these soon. I love that there’s yogurt in the crust too. I love baking with yogurt; I feel like the yogurt adds lovely moistness and fresh and new flavours…I make my blueberry muffins with yogurt and they just taste SO much better than the old recipe I used to use. Raymund — if you’re in the neighborhood, I can alway whip up a batch! Savvy Student – I’m so glad you stopped in and found one of my favorite desserts ever. The yogurt (or I sometimes use mayo) saves the shortbread crust from breaking your teeth. Let me know how they turn out.